It's been a while since I've shown you the windows of Le Printemps... I passed by this department store Saturday and saw that they dedicated their windows to Alice (Alice in Wonderland of course). All this in association with Disney who produced this new version of Alice made by Tim Burton ( I can't wait!). A lot of designers and clothes manufacturers participated in the event and the windows are really cool. Check the other ones directly on the Printemps' site and the movie trailer in French. Oh, yeah — Johnny! Johnny!! Johnny!!! Am really looking forward to this film. Will you see it, Eric? Thanks for the trailer. Just realized you said you can't wait, so I guess you WILL be seeing this film! Curious. Strange and fun-- just like a Tim Burton film. A)Did anyone else see the Tim Burton exhibition at MOMA? B)I love the French version of Tim Burton. C) I wish I could still wear a miniskirt and get away with it. Oh, the film looks trop cool. (Does anyone actually say that?!) I'm such an incurable 3d IMAX junkie - I'm on my 3rd viewing of Avatar and, well, as you say,Alexa... Johnny, Johnny, Johnny... right?!! Very nice photo, once again, notre roi. 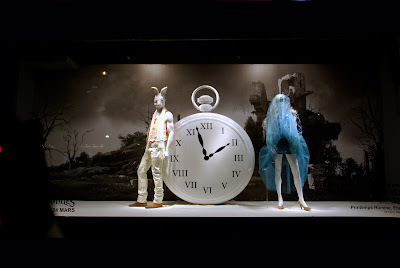 But, I am always a little thrown by these windows - they always seem to be sort of disturbingly surrealist pieces, not sales windows at all, and put me into another realm altogether. Perhaps that's the goal? Yikes! that bunny man is really creepy! but I love the window nonetheless. & a great picture too Eric. I'm looking forward to seeing this movie too. How tastes a Ladurée Wonderland macaroon ? Just wonder... yummy I guess! Very cool! And yes, I'm really looking forward to Tim Burton's Alice. And Johnny. Not necessarily in that order. I came to your blog just when I was surfing on this topic. I am happy that I found your blog and information I wanted. We wish you all the best for this memorable paintings, by the team of Famous Artists?? Could look at these windows forever. Please keep showing them! Lovely. Just the thing for a Monday morning. Have been at work for half an hour and all I've done is visit your blog, viewed the Printemps panorama view of Paris and watched the Alice in Wonderland trailer in French. I can't wait for the movie either. Johnny Depp - Ooh la la! And as for creepy, Charles Dodgson was a pretty creepy guy. When I was window shopping Saturday, I noticed that they were selling a lot of film items promoting this new film. Tim Burton and Johnny Depp are a good team (in my opinion). When does it open; do you know? I think I'll come to Paris this weekend and get in line--if NY doesn't close down with another big one! We dodged the Washington whiteout! BTW, I'm just back from Invictus: I loved it. Very very moving. Thanks about Invictus! Make me want to go and see it. Okay, I feel like a real idiot, but I can't find the store windows on the Printemps site. The link takes me to the main site and I have searched what seems like everywhere for the windows. What am I missing? The home of the homeless?